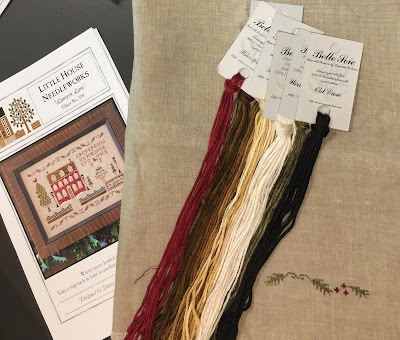 Queen of Harvest by With Thy Needle & Thread - 40 ct. Legacy by Picture this Plus using all the called for hand-dyed cotton threads (1 over 2). Oct. 31st by With Thy Needle & Thread - 40 ct. Legacy by Picture this Plus using the called for hand-dyed cotton threads (1 over 2). Summer Schoolhouse - Lesson 3 by With Thy Needle & Thread - 28 ct. Mushroom Lugana using the called for hand-dyed cotton threads (1 over 1). Lantern Lane is very cute! Saw it on flosstube, just have not figured out how to comment yet! Very nice finish! 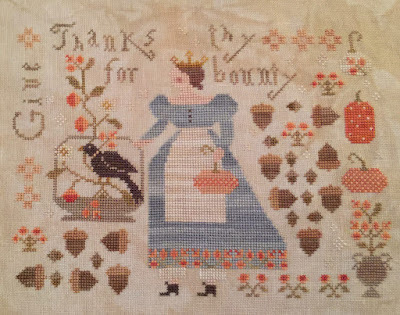 You do lovely work... and all those samplers on high count! Wow! These tired eyes send you kudos!! Hugs! Nicole, you are doing a great work, your videos are always clear and easy to follow. I will subscribe to your blog for more posts like this. Hi Nicole! I just discovered your blog although I watched a few of your videos. I love absolutely everything you stitch and going back in time discovered a few Drawn Thread didn't know. I love The Riddle for instance.